Coal reserves in Tanzania are estimated at 1.9b t, 25% of which are proven, according to the Tanzania Minerals Audit Agency (TMAA). Production of bituminous coal in Tanzania rose significantly during 2010–2013, from 179t to 128,920t. Coal in Tanzania is currently exploited in small scale at Kiwira Coal Mine in Mbeya Region and Tancoal Energy Limited Mine at Ngaka in Ruvuma Region. The Kiwira Coal Mine is 100% owned by Tanzania’s State Mining Corporation (STAMICO). STAMICO owns a 25-year special mining license within the Ivogo Ridge of the Songwe-Kiwira coalfield which is situated South-East of Mbeya City within Ileje District. The Ivogo ridge is estimated to have over 35m t of reserves. STAMICO is now looking to develop a 1.2m t per year opencast coal mine and a 200-MW thermal power plant (TPP) at Kiwira. STAMICO’s development plan also includes expansion of the existing underground mine to increase coal production from its designed capacity of 150,000t to 300,000t annually. To achieve this STAMICO is looking for a contractor to develop the project. According to an earlier tender issued by STAMICO, the joint venture partner is expected to provide 100% financing of the project and participate in the operations of the project. 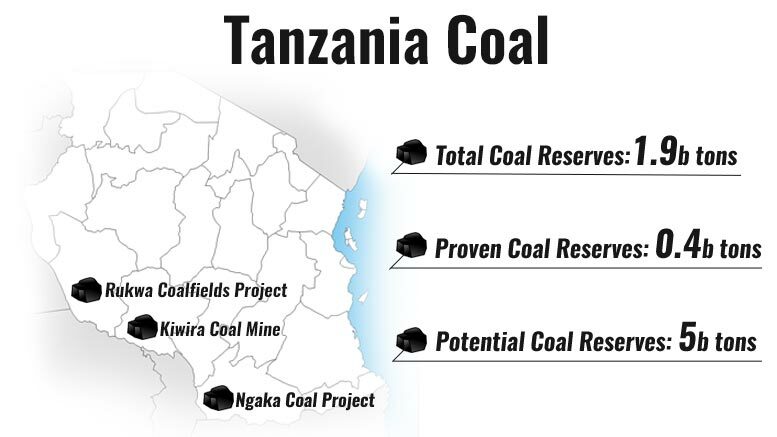 The Ngaka Coal Project is operated by Tancoal Energy, which is a joint venture between the National Development Corporation of Tanzania (NDC) and Intra Energy Tanzania Limited (IETL). The Ngaka project is located in South-Western Tanzania. The Ngaka Basin comprises the Mbalawala sub-basin in the south and the Mbuyura-Mkapa sub-basin to the north. Tancoal has proven coal resources of 212m t, and expects this figure to increase significantly as further drilling at Mbalawala and Mbuyura-Mkapa is conducted. Tancoal commenced mining operations at Ngaka in 2011, with the initial goal of selling up to 250,000 tons per annum (Mtpa) of unwashed coal to Tanzania’s domestic customers. The Ngaka Coal Project is expected to produce between 2-3Mtpa of coal for export. At an estimated maximum production rate of 4-5Mtpa, the Ngaka Coal Project has sufficient proven coal resources for over 50 years of profitable, low-cost production. The currently exploited coal in Tanzania is used for industrial applications. Tanzania’s industries use coal for thermal applications, particularly in cement factories and agro-processing industries, while coal briquettes for cooking are being promoted. The 2015 National Energy Policy of Tanzania indicates that according to geological information the country’s coal reserves potential could be 5b t.
Coalfields with the highest potential are Ketawaka-Mchuchuma in the Ruhuhu Basin, Ngaka fields in the South-West of Tanzania and Songwe Kiwira fields. At the beginning of 2016, UK-based energy and mining company, Edenville Energy Plc (LSE:EDL) was granted with a mining license by Tanzania’s Ministry of Energy and Minerals (MEM) to develop its Rukwa coalfields project in the country’s south western region. The company plans to invest USD176m in an open-pit coal mine and a 300MW coal-fired power plant. According to MEM, the coal-fired power plant is planned to start construction works between February and April 2017. Tanzania currently generates less than 1% of its total installed capacity of 1,754MW from coal-fired power plants that are fully supplied by imported coal according to the African Development Bank (AfDB). In 2013 Tanzania imported USD1.35m of coal briquettes to supply its coal-fired power plants, mostly from Malawi, accounting for 86% of the total imported according to the Massachusetts Institute of Technology (MIT). According to Edenville, the Rukwa Coalfields could potentially help diversify Tanzania’s energy feedstock in partnership with a power provider. Tanzanian based coal exploration and development company Tancoal Energy is set to increase the production capacity at the Ngaka coalfield in southwestern Tanzania. Australian mining company Intra Energy Corporation (ASX:IEC) and Chinese hydropower company Sinohydro Corporation will jointly develop the 270MW Ngaka coal power station in south-western Tanzania.